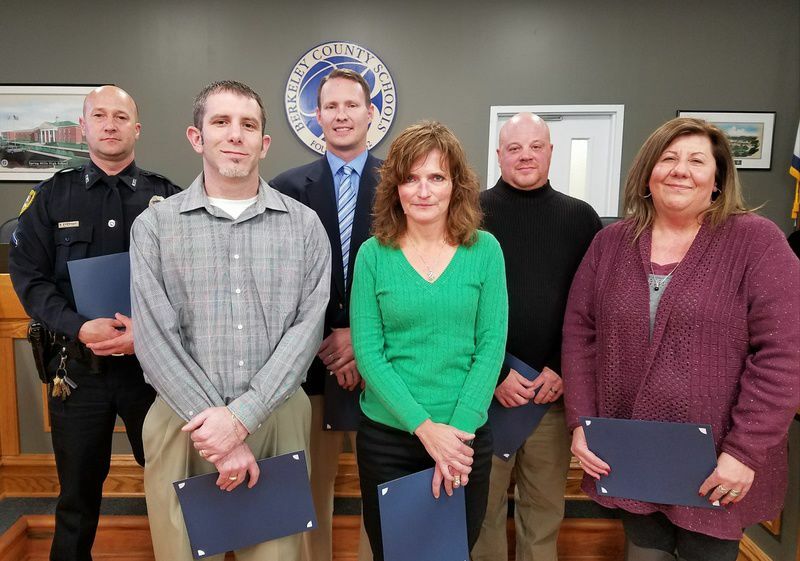 From left, Martinsburg (W.Va.) High School resource officer Shane Everhart, teacher Justin Slonaker, Principal Trent Sherman, school nurse Rhonda McDaniel, ISS teacher Rob Jones and secretary Jan Kidwell were recognized Monday night by the Berkeley County (W.Va.) Board of Education for their efforts Dec. 13 in reviving 17-year-old high-school junior Dakota Domer. MARTINSBURG, W.Va. — A handful of faculty and staff members at Martinsburg High School were recognized at Monday night's Berkeley County (W.Va.) Board of Education meeting for their efforts to revive a 17-year-old student who suffered a medical emergency last week. Dakota Domer's mother, Kimberly Domer, said in an interview Tuesday morning that her daughter still was on a ventilator at Children's National Medical Center in Washington, D.C.
"They're forever in my gratitude," Domer said of the aid that was rendered to save her daughter's life. Domer, who became unresponsive in a classroom Dec. 13 at the end of the school day, was revived through the combined response of resource officer Shane Everhart, ISS teacher Rob Jones, secretary Jan Kidwell, school nurse Rhonda McDaniel and teacher Justin Slonaker. "To everybody that was involved, they just did what they were supposed to do like this," Martinsburg High School Principal Trent Sherman told school board members while snapping his fingers three times. "They didn't even think about it. They just did it and took care of what needed to be taken care of — and that decisiveness, that control is certainly what helped save this young lady's life, and they certainly deserve to be recognized for that." "I'd love to send you to Hawaii," Berkeley County Schools Superintendent Manny Arvon told Everhart, Sherman and fellow staff members before presenting them with certificates of recognition and a Berkeley County Schools pin. Arvon commended everyone involved for working their "magic" to revive the girl through CPR and use of an automated external defibrillator, or AED, which typically is used to help those who experience sudden cardiac arrest. "Each one of you just did amazing things, and we're so grateful for that," said Arvon, who recounted seeing the relief on the faces of school staff members after Dakota was taken by ambulance to Berkeley Medical Center in Martinsburg. Domer said her daughter, who was put on life support, was flown from Martinsburg to the children's hospital for treatment. In a telephone interview from the hospital, Domer said she was notified of her daughter's medical emergency when she was at work. "When I got that call, my world came crashing down," she said. Domer said her daughter is her "fighter," having overcome epilepsy-related medical challenges since she was a young child. And Domer said Dakota, a junior, always has loved going to school and seeing her friends there. "She will fight us to go to school," she said.